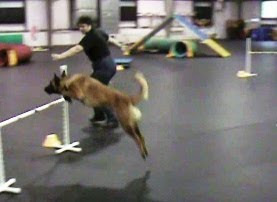 Dazzle and I have been going to the training center for the agility run-throughs on Friday evenings. (Video links to each run are at the bottom of this post) Prior to our second run yesterday, we had only done partial courses (I didn't want to push the number of sequences too high too fast). 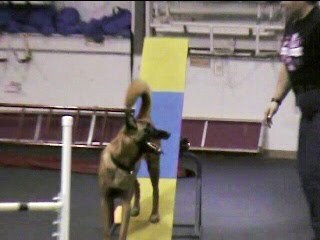 Last night, on the second run we did the whole course and he did great! I set his toys at the start line for the first run because I knew we would end up near there and after the tunnel, I marked with "YES!" and he ran to get his toys. For the second run, I put the toys off to the side of the dog walk because that was closer to where we would end up. He had a moment of distraction at that point as he was approaching the dog walk, but got back to work quickly when I kept moving and he didn't hear "yes" (verbal clicker). The video of the second run starts with the A-frame because the person I asked to video didn't start the camera till then (oops! :-) He did great to that point, so I'm not worried about what's missing. He slid off the A-frame down contact again though and I didn't want him to get rewarded by continuing, so I had him re-do it. It doesn't seem to bother him to repeat things, so I use it for clarification. But it lets me know what needs more work during training. 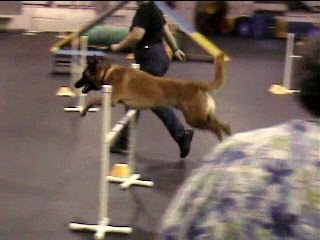 The first run, I had trouble with a "go out" to a double bar jump. As I was running it, I thought I was turning my shoulders toward it and using my arm ok, but video review showed I wasn't. My arm position and my movement was sending him on the path he took instead of out away to the jump. So I fixed that on the second run by making a left after the bar jump to clearly indicate that the double was next. We haven't really worked too much on the go outs yet, so I wasn't surprized that he needed extra help. But it's good that I'm aware of that need. I chose to stop and re-set the bars on the first run to try to help him get it right, but I still wasn't enough help on that run for him. The other place I had trouble was after the 2 jump sequence that followed the red tunnel. After the second jump, I was trying to get him to go directly into the tunnel under the A-frame (I thought that was the course) but again I didn't turn my shoulders enough and didn't change my direction of travel enough. So he took the A-frame (and got the 2 on/ 2 off down contact :-) and then I sent him into the tunnel. On the second run, I knew I was going to pull him to the table and that helped my body language. On the second half of the 2nd run, I lost Dazzle twice by doing a rear cross. 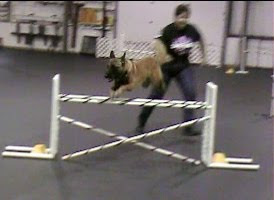 Clearly something I'll have to teach him :-) Or I'll have to adjust my route and handling to avoid the rear crosses. I could have had him wait on the teeter till I was on the far side of the first jump that followed and could have run on the outside of the weaves or crossed behind there after he started the weaves. I wish I had done video of our previous practice runs. I think the video review REALLY helped! And it helps to be able to look at it, and then run the course again to see if what I think will help actually does :-) But two times around the course was the pushing limit of my knees! I really need to get him working out away from me more so I don't have to run so much. P.S. Buster is doing well and is on a new diet with lots of supplements. Keeping my fingers crossed! Please keep those prayers coming for him.